Can Peter Ruckman be trusted to give an objective view of facts in areas that could affect some of his views? Is he fair and impartial with the facts? You be the judge. But those books were of such doubtful authority that Martin Luther and the King James translators took them out of the Old Testament Canon and stuck them between the two Testaments with a note that, though they were recommended reading (like the Scofield notes), they were not inspired Scripture. To the KJV translators’ credit, they did place the Apocrypha between the Testaments, instead of interspersed in the Old Testament. However, there was no "specific note" as Ruckman states, "that it was not the inspired word of God and not considered to be holy scripture." The Apocrypha in the original KJV 1611 still had chapter and verse divisions, as well as marginal notes. Each page of the Apocrypha was identical to the rest of the Bible with the exception of a double heading labeled “Apocrypha” (meaning "hidden" in Greek) at the top of each page. The last page of the Old Testament had the remark “The end of the Prophets.” The start of the Apocrypha did not have an elaborately illustrated title page as the beginning of the Old and New Testament, but rather a quarter-page heading slightly larger than the start of each Old Testament book. At the end of the Apocrypha there was simply a line that stated "The end of Apocrypha." Strangely, no mention was made of the Apocrypha in the preface of the KJV entitled The Translators to the Readers. No warning could be locating indicating to the unlearned that the Apocrypha was not true Scripture. 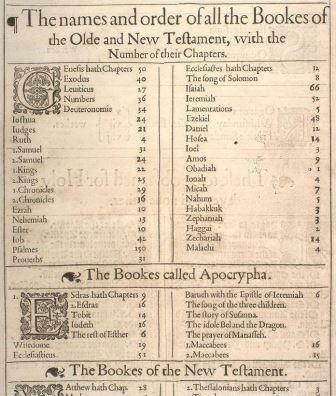 The index of books in the original 1611 edition did distinguish the Apocrypha, but in an incomplete form. This is because the heading at the top of the index page states “The names and order of all the Bookes of the Olde and New Testament, with the Number of their Chapters.” The books of the Apocrypha have the number of their chapters just like the Testaments. The index could cause an unlearned person to assume that the Apocrypha is a section of the Old Testament (also remember that the end of Malachi had a note stating it was the “end of the Prophets,” instead of the end of the Old Testament). Ruckman is only right to the extent that the 1611 edition of the KJV does indeed separate the Apocrypha from the Testaments, made it clear where it started and ended, and listed the books it was composed of in the index. However, to state that the translators made a specific note by the Apocrypha “that it was not inspired” is simply not true. It was also not true for Ruckman to claim that “the Apocrypha was placed between the testaments with a note that it was not the Scripture.” No note could be found anywhere in the 1611 edition in which the translators affirmed the Apocrypha was not Scripture. Those who are familiar with the Scriptures would naturally be able to recognize that Apocryphal sections are not to be treated as Scripture, but the unconverted, new or uninformed Christians could have thought all portions with chapter and verse numberings to be Scripture as presented in the 1611 edition. Although it has some merit for its historical value, it is unfortunate that the KJV translators took the Apocrypha more serious than they should have. 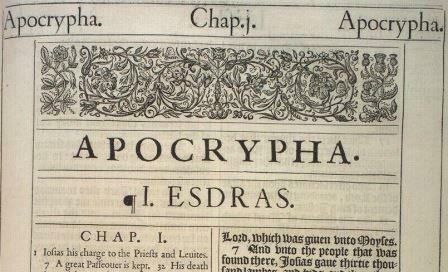 In addition to its inclusion between the Testaments, a schedule of Scripture readings for morning and evening prayer included passages from the Apocrypha, and the 1611 edition also had some marginal cross-references to books of the Apocrypha in the Old and New Testament. All this does not mean that the KJV translators themselves believed the Apocrypha was true Scripture, but the issue is whether there was a statement or note to that effect as Ruckman claims. the Hebrewe Volumes, so of the New by the Greeke tongue, he meaneth by the original Greeke. If truth be tried by these tongues, then whence should a Translation be made, but out of them? … the tongues wherein God was pleased to speake to his Church by the Prophets and Apostles…Origen… he overshot himselfe many times. [Above the underlined portion there is a handwritten note stating “No Apocrypha Included”]. The above only reinforces what knowledgeable Christians already know: That Bible translations should be done from the Greek and Hebrew, and truth should be tried by these tongues, and it was the languages through which God spoke to the Bible writers. However, it does not inform ignorant readers that this would exclude the Apocrypha. The pictures only served to show that Ruckman was making exaggerated claims in his zeal to defend the KJV. In the Wyclif Bible, which was the first translation of the Bible into English [in 1385], the prologue listed the books of the Hebrew Canon and added, "Whatever book is in the Old Testament besides these. . . shall be set among the Apocrypha, that is, without authority of belief." The complete edition of Martin Luther's Bible appeared in 1534 with the Apocrypha separated from the rest of the Old Testament and placed between the Old and New Testaments under the title, "Apocrypha; that is, Books which are not to be considered as equal to Holy Scripture, and yet are useful and good to read." The Geneva Bible of 1559 contains the Apocrypha preceded by an article entitled "The Argument" asserting that these books were not received by a common consent to be read and expounded publicly in the church, and that they could not be used to confirm a matter of doctrine excepting in instances where they are in agreement with the canonical Scriptures. The King James translators therefore placed it between the Old and New Testaments for its historical benefit to its readers. They did not integrate it into the Old Testament text as do the corrupt Alexandrian manuscripts. The book A list of editions of the Holy Scriptures and parts thereof; Printed in America previous to 1860 by E. B. O'Callaghan in 1861 lists dozens of editions of the KJV printed with the Apocrypha before 1860. For more recent reference material on the issue, see A Textual History of the King James Bible by David Norton. The inclusion of the Apocrypha was a mistake—but to not single out the KJV translators—it was a mistake of Protestant translators and printers of the era. It does not make the actual text of the Old or New Testament of the KJV any less accurate. The text of the King James has passed the test of time, and is accurate and reliable. Was Ruckman factual, ethical, and above board in his affirmations about the Apocrypha and the 1611 KJV? The facts indicate he was not. This is more proof in addition to what has already been presented throughout this website demonstrating that Ruckman’s writings cannot and should not be trusted. The prevaling reason the Deuterocanon or Apocrypha was removed is for this reason: the Authorized Version translators in their companies did not sufficiently distingush the apocrhypal writings as such, and men began to lean upon them for doctrine. What you say there about the Apocrypha and the KJV translators is plain wrong!!! The Roman Catholic Church was relying on the Apocrypha for doctrine long before, and long since, the KJV translators translated those books. Furthermore, the KJV translators made careful notes for why these were not accepted as part of God’s Word, and put them bewteen the Old and New Testaments to mark them off from the inspired Word as historical reading. Your accusation has no basis in reality! For one, I don’t care at all about any of the creeds you bring up. You can look to man-made creeds all you want, but that’s not where I get my beliefs. Furthermore, in order for you to prove that any majority of Protestants relied on the Apocrypha in the KJV for any particular doctrine or doctrines, you would have to cite many, many examples of writings and occurrences where this was the case. You have not provided even one example. As for the inspiration of the KJV, only folks of your ilk have this bizarre and unscriptural belief that the words of God somehow lose their inspiration when translated. I don’t share in that fairy tale. I owe you no apology and you certainly will not receive one lol. I will admit, however, that it was a tremendous blunder for the KJV translators to waste even a minute of their time translating the Apocrypha, IMHO. That is one piece of KJV history that I regard as a huge embarrassment. We are done. Let God most High be the judge of this matter. Despite your long and angry rant, you still did not cite one example where any majority of people who read and studied the Authorized Version while the Apocrypha was part of it relied on those books for doctrine, as you so boldly claimed above. God did not have to inspire the AV, the words that were translated were ALREADY inspired! I am not claiming that God had to re-inspire His words because they were translated in the King James Bible! But, that is not the topic of this article is it? The topic we are discussing is the Apocrypha. Nor were we discussing Riplinger or anyone else. Furthermore, I haven’t said anything libelous at all, so really don’t know where you’re getting that idea from. If the shoe fits, then wear it Particular Baptist. Come to think of it, it is kind of funny when folks like you consider the inspiration of the KJV to be a man-made doctrine. Kind of hypocritical isn’t it? Throwing around other man made creeds as authoritative, all the while condemning another that you consider man-made as well. Also, when the Apostles quoted the Old Testament Hebrew in the New Testament, they translated it into Greek. So don’t give me this nonsense about translations not being inspired! I beg to differ sir. See extract from website below. I think the understanding of the meaning of the word 'Apocrypha' was common knowledge and plain enough at the time of publication of the AV for the general populous to know it was not cosidered Canonical by the translators. If you look at a copy of the original 1611 King James Bible, the book of Malachi ends with these words: “The end of the Prophets”. Then the whole Apocrypha, which itself means “unknown, or spurious” is clearly marked off from the rest of the Scriptures by the words “Apocrypha” twice at the top of every page throughout. It then ends with these words: “The end of Apocrypha”. Then on the next page is an elaborate woodcutting and it says: “The Newe Testament of our Lord and Saviour Jesus Christ.” All King James Bible contained the Apocrypha in the inter-testamental section until 1666. Then it began to be omitted in subsequent printings. You beg to differ what? That Ruckman stated repeatedly that the KJV translators placed a “specific note” or “statement” in the KJV that the Apocrypha was not inspired? Where is that specific note or statement? Are you defending Ruckman’s deception? Your own documentation contradicts Ruckman. I quoted Ruckman saying that after a couple years (implying 1613) the KJV translators threw out the Apocryha, and it didn’t reapear in the KJV. Can Ruckman be trusted to get basic facts straight? Were other Ruckmanites honest when they claimed in print that the KJV translators provided seven reasons why it should be rejected? The point of the article wasn’t to question the KJV in general or its translators. I even pointed out “All this does not mean that the KJV translators themselves believed the Apocrypha was true Scripture…” Ruckman was the one under the microscope to test his credibility. I pointed out just about everything that you pasted from another website. All the basic facts had already been presented. Ruckman is the one who conveniently omits key facts and fabricates history. You cannot beg to differ with established facts. Since Dr. Ruckman has went to be with the Lord and is no longer here to defend himself I am calling upon the owner of this website to have some class and do the right thing and to shut down this website because it is both shameful and immoral to keep attacking Dr. Ruckman when he can no longer be here to defend himself. Does what you say apply to Ruckman? Notice what Ruckman said about an administrator from the institution where he studied after acknowledging that he had just died. He accused him of having produced “one of the most nonproductive and destructive works by any minister in this century, on the North American continent.” As if that wasn’t enough, Ruckman added that “His reputation, background, position, personality, and place of authority doubled the damnation of his effect on young ministers.” (Ruckman, Peter. Bible Believers’ Bulletin. June 1998, pp. 6, 18) This is only one example. Many more could be provided. Pastor Dan, based on what you defined as not having class, being both shameful and immoral, does Ruckman not also deserve such a designation? Or do the rules never apply to the false teacher you appear to defend? I did not approve your post for obvious reasons. I’m not in the habit of editing posts, but instead of deleting it completely, I preserved intact the only part that was relevant to this article about the Apocrypha amid your unsupported allegations that I called God a liar, that I am jealous of Ruckman, etc. There is no question or debate as to whether the translators included a note in their first edition “about whether or not they believed the Apocrypha was part of the Holy Scriptures.” You said “may or may not have” in order to not make a determination that would lead to the conclusion that Ruckman was deceptive. But why did the kjv translators included the apocrypha in the first place if it is not part of the bible and are questionable books, what for?